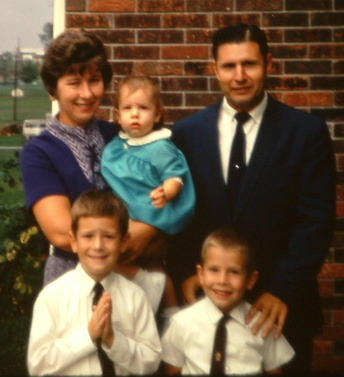 Unfortunately, Mom got pregnant on her first attempt, and the string of fertility triumphs continued with four pregnancies in four years, and then, a bonus...Brenda! This her first birthday. 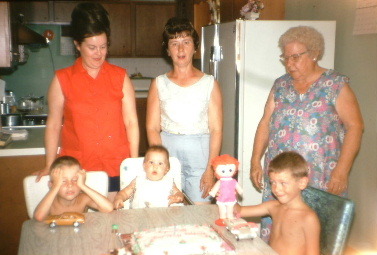 Left to right: Me (showing signs of stress at the age of five), Pat Kohlmeyer, our friendly neighbor, Brenda with blank stare, Mom with blank stare (interesting), Darrel trying to make it with a Ragedy Ann doll, and my father's mother Freda Paul. We didn't get air conditioning until the mid-70's so we dressed accordingly, those of us who were actually wearing clothes. 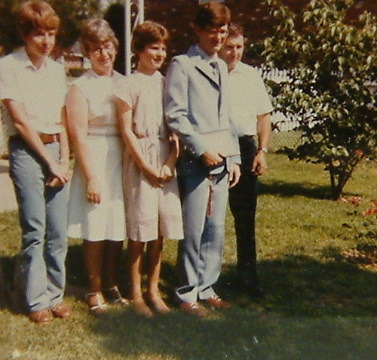 Above, to the left is my brother Darrel's first communion in the fall of 1971. We were all Catholics and each one of us went through the common Catholic rituals. And you see some rare photos of Dad in a formal suit. He rarely wore anything but blue jeans. 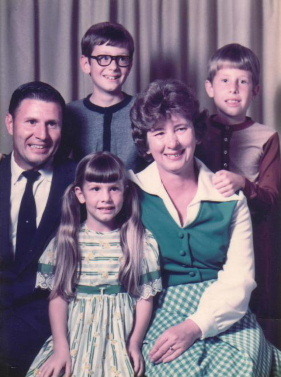 To the right is a family picture shot in the summer of 1975. 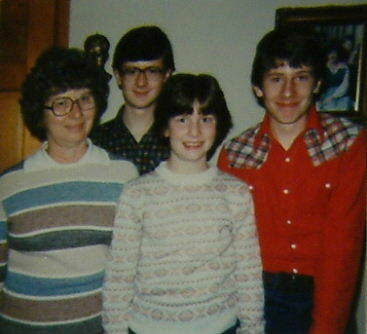 I remember being particularly uncomfortable with having to put my hands on Mom's shoulder. At this point I was not into any kind of touching. I was one of those kids who kept saying,"Stop touching me!" even up into my teen years. Left, Dad, age 46 on April 10, 1977. 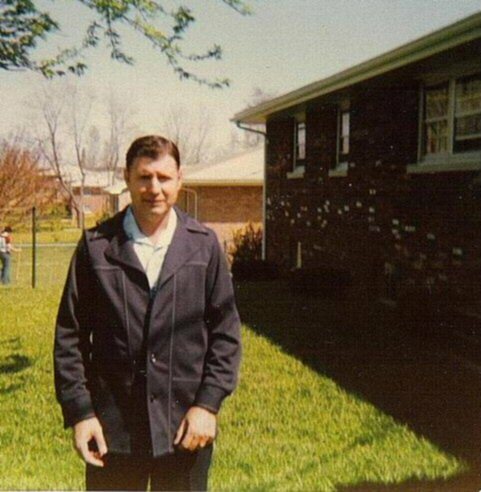 He's standing in the back yard of the house I grew up in on the West Side of Evansville, Indiana. This was a special occasion...he's wearing a suite. He only wore them to funerals from my recollection so this is puzzling to me. 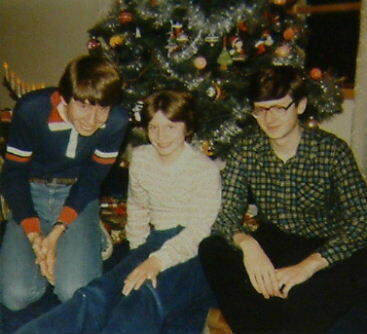 We'd moved here on June 12, 1969, Mom, Dad, older brother Darrel and myself. This was big for us...2700 square feet, almost half an acre of land, a two-car garage, out in the country. So to celebrate, Mom and Dad made a little sister for Darrel and I. I'm not sure Dad wanted to spend that much on a housewarming gift but this one was strictly no-returns, no-refunds. I should know...I tried to get Dad to return her. She was missing parts. Above left you see Christams Eve 1981, then above right, Christmas Eve 1982. As you can see, my older brother Darrel was going through his stage when he thought he was too mature to be in family photos. Then to your left, June 1982 when my brother graduated Mater Dei High School. There aren't too many photos of my father because he was always the one to shoot the photos... and...therefore...he was behind the photo. Turn around and you might sense his presence.